I’ve had the design for this hat in mind for over a year now. White. Simple. Just a bit of cloche-shaping at the bottom. And, of course, a giant flower on the side. 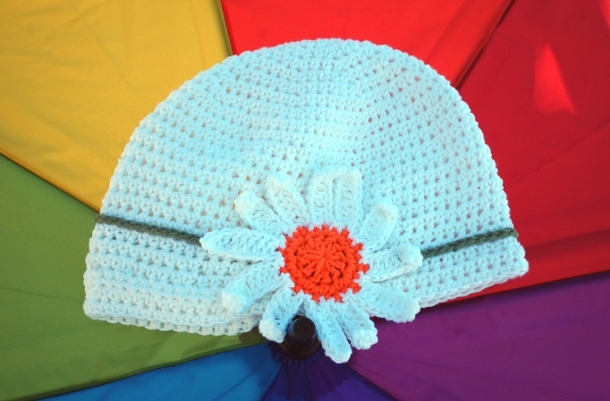 I made it a daisy for no reason other than the fact I wanted to try and make one, but I think it looks great. 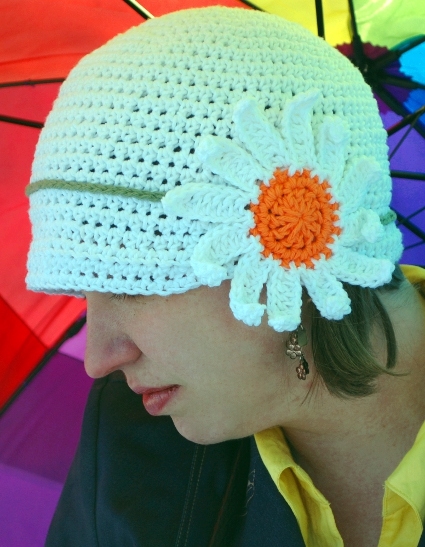 It’s a beautiful spring hat, and I’m ready for Spring! Note: Do not join rounds unless directed. Hat is worked in a continuous spiral. Rnds 10-21: Hdc in each st around. Brim: Sl st in next st, turn. Row 1: Sc in next hdc, hdc in each of the next 27 hdc. Sl st in next st, turn. Row 2: Sc in next hdc, hdc in each of the next 26 hdc. Sl st in sc. Edging: Sc in each st around entire bottom edge. (72 sc) Join with a sl st, finish off. Rnd 1: With Orange, make magic ring. Make 12 dc in ring, pull tight and join rnd. Rnd 2: Ch 1. [Sc inc] in each st around. (24 sc) Join round, finish off Orange. Start White. Petal: *Ch 9. Sk 1 ch, sc in next ch, hdc in next ch, dc in each of the next 6 ch. Join in next st of Rnd 2 with a sl st, sl st in next st. Repeat from * around for a total of 12 petals. Finish off. 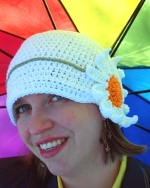 Band: With Avocado, ch 80 or amount necessary to encircle hat without binding. Finish off. Sew Band in place around Hat. Sew Daisy over Band at side. Weave in all ends. Wow that looks great! I like the bright sunny background too. Just to clarify, when you say “turn” am I simply stitching around the corner so to speak or am I stitching on the opposite side?